Uranium metal is autopyrophoric and can burn spontaneously at room temperature in the presence of air, oxygen and water. At temperatures of 200-400 degrees Centigrade, uranium powder may self-ignite in atmospheres of carbon dioxide and nitrogen. Oxidation of uranium under certain conditions may generate sufficient energy to cause an explosion (Gindler 1973). Friction caused by bullet or missile entry into a tank or armored car, for example, can cause the uranium to ignite, forming a concentrated ceramic aerosol capable of killing most personnel in the vehicle. Depleted uranium was used extensively in place of tungsten for ordnance by the US and UK in the Gulf War. There is no dispute of the fact that at least 320 tons of depleted uranium (DU) was "lost" in the Gulf war, and that much of that was converted at high temperature into an aerosol, that is, minute insoluble particles of uranium oxide, UO2 or UO3 , in a mist or fog. It would have been impossible for ground troops to identify this exposure if or when it occurred in war, as this would require specialized detection equipment. However, veterans can identify situations in which they were likely to have been exposed to DU. Civilians working at military bases where live ammunition exercises are conducted may also have been exposed. Uranium is both a chemical toxic and radioactive hazard: Soluble uranium is regulated because of its chemical toxicity, measured by damage to the kidney and tubules. Uranium is a heavy metal, known to cause uranium nephritis. Insoluble uranium, such as was released in the Gulf War, is regulated by its radiological properties, and not its chemical properties. Because of its slow absorption through the lungs and long retention in body tissues, its primary damage will be due to its radiological damage to internal organs rather than chemical damage to the renal system. Obviously, both types of damage occur simultaneously, therefore it is a matter of judgment which severe damage, radiological or chemical, occurs at the lowest dose level. However, with the lengthening of the time during which the contaminant resides in the body and the low overall dose, the risk of cancer death becomes greater than the risk of significant damage to the renal system. Uranium decays into other radioactive chemicals with statistical regularity. Therefore, in its natural and undisturbed state, it always occurs together with a variety of other radioactive chemicals, some of the best known being thorium, radium, polonium and lead. Natural uranium in soil is about 1 to 3 parts per million, whereas in uranium ore it is about 1,000 times more concentrated, reaching about 0.05 to 0.2 percent of the total weight. Depleted uranium concentrate is almost 100 percent uranium. More than 99 percent of both natural and depleted uranium consists of the isotope U-238. One gram of pure U-238 has a specific activity of 12.4 kBq, which means there are 12,400 atomic transformations every second, each of which releases an energetic alpha particle. Uranium 238 has a half life of 4.51 E+9 (or 4.51 times 10 to the 9thpower, equivalent to 4,510,000,000 years). Each atomic transformation produces another radioactive chemical: first, uranium 238 produces thorium 234, (which has a half life of 24.1 days), then the thorium 234 decays to protactinium 234 (which has a half life of 6.75 hours), and then protactinium decays to uranium 234 (which has a half life of 2.47E+5 or 247,000 years). The first two decay radioisotopes together with the U 238 count for almost all of the radioactivity in the depleted uranium. Even after an industrial process which separates out the uranium 238 has taken place, it will continue to produce these other radionuclides. Within 3 to 6 months they will all be present in equilibrium balance. Therefore one must consider the array of radionuclides, not just uranium 238, when trying to understand what happened when veterans inhaled depleted uranium in the Gulf War. It should be noted that uranium 235, the more fissionable fraction which was partially removed in enrichment, makes up only 0.2 to 0.3 percent of the depleted uranium, whereas it was 0.7 percent of natural uranium. It is this deficit which enables one to use analytical methods to identify the uranium found in veteran's urine as depleted and not natural uranium. The U 235 was extracted for use in nuclear weapons and nuclear reactor fuel. 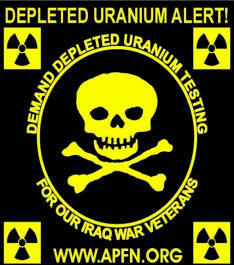 Depleted uranium is considered nuclear waste, a by-product of uranium enrichment. Regulatory limits recommended by the International Commission on Radiological Protection [ICRP] assume that the maximum permissible dose for members of the public will be the one which gives the individual 1 mSv dose per year. This is in addition to the natural exposure dose from uranium in the food web. Assuming that this dose comes entirely from an insoluble inhaled uranium oxide, and using the ICRP dose conversion factor for uranium 238 in equilibrium with its decay products, one can obtain a factor of 0.84 mSv per mg, or a limit of intake of 1.2 mg (0.0012 g) per year for the general public. This would give an added radiation dose of 1.0 mSv from uranium, and an increase of almost 2.75 times the natural uranium intake level. Nuclear workers would be allowed by the ICRP maximum permissible level, to reach an annual dose of 20 mSv, comparable to an intake of 24 mg of uranium, 55 times the normal yearly intake. The maximum dose per year from anthropogenic sources can be converted to the maximum concentration permissible in air using the fact that the adult male breathes in about 23 cubic metres of air in a day [ICRP 1977]. The maximum permissible concentration in air for the general public would be: 0.14 microgram per cu metre, and for workers: 2.9 micrograms per cu m assuming the Gulf War situation of continuous occupancy rather than a 40 hour work week, and an 8 hour day. It is common in the US and Canada to refer to 2000 pounds as a "ton", whereas the British "ton" is 2240 pounds. Both are roughly 1000 kg. Just in order to understand the scale of the ceramic uranium released in Desert Storm, at least 300 million grams were "lost", and breathing in only 0.023 g would be equivalent to the maximum permissible inhalation dose for a nuclear worker to receive in a year under the 1990 recommendations of ICRP. When chelation processes have been initiated the rate of excretion of uranium in urine will be increased and there is a risk of damage to kidney tubules. Therefore careful urine analysis for protein, glucose and non-protein nitrogen in important. Some researchers have also reported specifically finding B-2-microglobulinuria and aminoaciduria in urine due to uranium damage. In a study of uranium toxicity by the US Agency for Toxic Substances and Disease Registry [ATSDR 1998], released for public review and comments by 17 February 1998, exposure times were divided into three categories: acute, less than 15 days; intermediate, 15 to 365 days; and chronic more than a year. Most of the Gulf War Veterans would have had chronic duration exposure from the point of view of the length of time the material remained in the body. However, this ATSDR division was based of the duration of the presence of the external source of contamination, not its residence time in the body, therefore it would, in most cases be considered intermediate duration exposure. There is very little human research available to clarify the effects of intermediate duration exposure to humans. It should not be assumed that lack of research implies lack of effect on that particular system. It should also be noted that although one or more papers may exist for acute and chronic duration exposures, these do not necessarily cover the questions which one might like to raise. No comments on the quality or extent of the research is implied by this table. The more soluble compounds of uranium, namely, uranium hexafluoride, uranyl fluoride, uranium tetrachloride, uranyl nitrate hexahydrate, are likely to be absorbed into the blood from the alveolar pockets in the lungs within days of exposure. Although inhalation products also are transported through coughing and mucocilliary action to the gastro-intestinal tract only about 2 percent of this fraction is actually absorbed into the body fluids through the intestinal wall. Therefore all of the research papers on acute effects of uranium refer to these soluble uranium compounds via inhalation. The main acute effect of inhalation of soluble uranium compounds is damage to the renal system, and the main long term storage place of these compounds in the body is bone. These research findings do not apply easily to the insoluble uranium compounds to which the Gulf Veterans were exposed when the depleted uranium ordnance was used in battle. It is important to note that there is no scientific evidence which supports the US Veteran Administration claim that the insoluble uranium to which the Gulf War Veterans were exposed will be primarily a renal chemical toxicant. Yet this is the criteria which the VA proposes for attributing any health problems of the Veteran to depleted uranium. Intermediate and chronic exposure duration to insoluble uranium is regulated in the US by its radiological property. The slow excretion rate of the uranium oxide allows for some kidney and tubule repair and regeneration. Moreover, because of the long biological half life, much of the uranium is still being stored in the body and has not yet passed through the kidneys. The direct damage to lungs and kidneys by uranium compounds is thought to be the result of the combined radiation and chemical properties, and it is difficult to attribute a portion of the damage to these separate factors which cannot be separated in life. moderate fatty livers in 5 of 8 animals that died; focal necrosis of liver. proteinuria, elevated levels of NPN, aminoacid nitrogen/creatinine, abnormal phenol-sulfonphthalein excretion. Increased urinary catalase; diuresis. severe muscle weakness; lassitude [3 with F]. Uranium tetrafluoride, UF4 , insoluble in water. Uranium hexafluoride, UF6 , soluble in water, highly chemically toxic. Uranyl Chloride, UO2Cl2 , uranium oxide salt. Uranium Nitrate, UO2(NO3)2.2H2O , soluble in water, toxic and explosive. DERMAL exposure was researched in humans only in the acute duration of exposure case. Animal studies on dermal exposure include acute, intermediate and chronic duration of exposure, and immunologic/lymphoreticular and neurologic effects. Damage to body organs occurred with intermediate or chronic exposure at doses as low as 0.05 mg per cu metre air. A generally sensitive indicator of exposure seems to be loss of body weight. However this finding is somtimes attributed to the unpleasant taste of the uranium laced food given to animals. There is also damage to the entrance portals: respiratory and gastro-intestinal systems; and the exit portals: intestinal and renal systems. Uranium oxide was associated with fibrosis and other degenerative changes in the lung. It was also associated with proteinuria, and increased NPN (non-protein nitrogen) and slight degenerative changes in the tubules. The more severe renal damage was associated with the soluble compounds uranium tetrafluoride and uranium hexafluoride (not thought to have been used in the Gulf War ordnance). Focal necrosis of the liver was only associated with uranium oxide. This may be a clue to one of its storage places in body tissue. Uranium oxide is also associated with hematological changes, lymph node fibrosis, severe muscle weakness and lassitude at intermediate or chronic dose rates in 0.2 to 16 mg per cu metre air. None of the uranium research dealt with the synergistic, additive or antagonistic effects potentially present in the Gulf War mixture of iatrogenic, pathological, toxic chemical and electromagnetic exposures. It is obvious that the US had some expectation of the health effects related to using depleted uranium ordnance in the Gulf War. This is evident based on military research and manuals. They would also have had access to information on chemical and biological agents which could protect against some of the harmful side effects. These agents might also "confuse" the toxicology of this exposure. Some potential radio-protective agents are thiols (also called mercaptans, these are organosulfur compounds that are derivatives of hydrogen sulfide), nitroxides (used as a food aerosol and an anesthetic), cytokines (non-antibody proteins released by one cell population, e.g T-lymphocytes, generating an immune response), eicosanoids (biologically active substances derived from arachidonic acid, including the prostaglandins and leukotrienes), antioxidants and modifiers of apoptosis (fragmentation of a cell into small membrane bound particle which are then eliminates by phagocytes). Just in case this is the reality and not merely a suspicion, it would be good to examine the after effects of exposure to ceramic depleted uranium in Iraqi veterans and in the survivors of the El Al crash at Shipol Airport, Amsterdam. It is unlikely that these two populations were given any protective agents. Each participant should complete a questionnaire [See draft questionnaire in Appendix A] covering general background variables, exposure profile and medical problems and symptoms. Each participant will agree to collect a 24 hour urine sample for analysis, and to take 500 mg blue-green algae (Spirulina) 48 hours before beginning the collection. This is a mild chelating agent. Each participant will agree to the analysis of this data for the benefit of all exposed persons, and to the release of the results of the analysis without identifying characteristics for individuals. There will be a high correlation between the questionnaire exposure estimates and the level of depleted uranium found in urine. Medical problems related to damage of the blood and/or hepatic systems will show an association with exposure data and urine sample analysis for depleted uranium. Encyclopaedia of Occupational Health and Safety, Third (Revised) Edition. Technical Editor: Dr. Luigi Parmeggiani, published by the International Labour Organization in 1983 (ISBN: 92-2--103289-2) Geneva, Switzerland. ICRP 1991: Recommendations of the International Commission on Radiological Protection. Publication, accepted in 1990 and reported in Publication 60. Pergamon Press, UK. Spiegel CJ, 1949. Pharmacology and Toxicology of Uranium Compounds. McGraw Hill Book Co.Inc. Stokinger HE, Baxter RC, Dygent HP, et al 1953. In: Toxicity Following Inhalation for 1 and 2 Years. Editors: Voegtlin C and Hodge HC. Stokinger HE, 1981. Uranium. In: Industrial Hygiene and Toxicology. Vol 2A, 3rd Edition. Editors:Clayton CD and Clayton FE. John Wiley and Sons, New York NY, 1995-2013.